Starting back in 1999 I had an opportunity to play around with Cinema 4D V5. I created many models, but finished few of them. My Mac was moderately powerful, but consumer hardware of the day really wasn't up to snuff with the requirements for 3D modelling. There also weren't many resources for learning software that complex, and what was available were mostly books that I had a hard time following. By 2002 I had put 3D aside for other pursuits. After many years of wanting to get back into 3D, but being sidetracked (or simply too lazy), I finally decided to take the plunge. There are plenty of great websites and video tutorials to learn from now, and it's far less of a chore with modern tools than it was 10 years ago. Besides, it would be good to check something off my "To Do" list that's been there for years. But now I was stuck with a new conundrum... where to start and what to model? This has always been a problem for me. I have lots of ideas floating in my head... too many sometimes. I'll often sit in front of my PC, open a program, and stare as I try to decide what to create. Half an hour of that, and move onto something mindless like web surfing or playing a game. 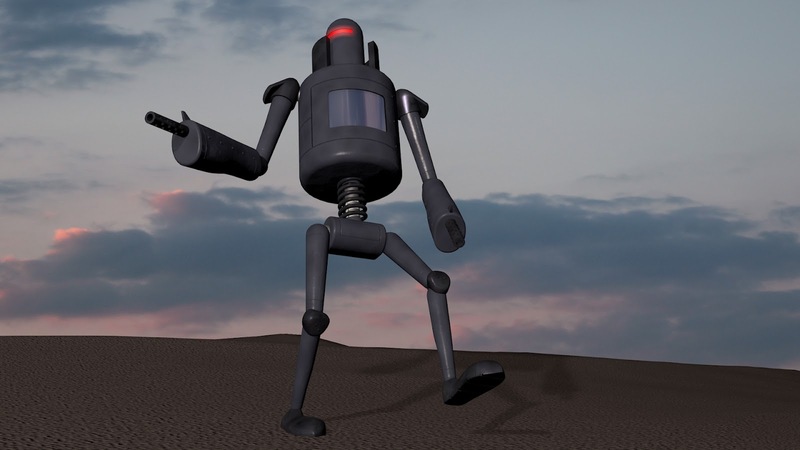 And so I was delighted to come across a contest on Joren Kandel's excellent blog: The Pixel Lab, in which he challenged his visitors to create a model of a robot or robot part, completely in Cinema 4D. This was a project perfect to get a noob like myself started, and it didn't matter if I won (and I certainly didn't expect I would). Pretty much all of the parts were simple primitives a performed some basic manipulations on. Most I didn't even convert to polygons. The shoulders proved difficult, and in the end I never really got them to something I like, but they were satisfactory enough. I made sure to rig the parts with axes in the right locations so the limbs would move appropriately. Texturing has always intimidated me, probably because I don't fully understand all the principles, and partly because my graphic design experience was mostly focused on vector art in Adobe Illustrator, which isn't really applicable. So my textures ended up pretty basic, though I was proud to have made some really simple bump maps to emulate seams between metal sheets. Basic as it is, I'm pleased with my robot. It was a great refresher on what I had learned 10 years ago, and it got me started actually playing with 3D once again. As expected, I didn't win the competition. There were far cooler models for that. But my model has been included in the free pack of robots from the competition. So go Download It to marvel at the wonder of what can be created in two weeks... oh and check out my robot as well!